The event-related potential (ERP) technique, in which neural responses to specific events are extracted from the EEG, provides a powerful noninvasive tool for exploring the human brain. This volume describes practical methods for ERP research along with the underlying theoretical rationale. It offers researchers and students an essential guide to designing, conducting, and analyzing ERP experiments. This second edition has been completely updated, with additional material, new chapters, and more accessible explanations. Freely available supplementary materials, including several online-only chapters, offer expanded or advanced treatment of selected topics. Event-related potentials (ERPs) have been used for decades to study perception, cognition, emotion, neurological and psychiatric disorders, development, and agin. ERPs consist of multiple components that reflect specific neurocognitive processes. In the past, there was no single source that could be consulted to learn about all the major ERP components; learning about a single ERP component required reading dozens or even hundreds of separate journal articles and book chapters. The Oxford Handbook of Event-Related Potential Components fills this longstanding void with a detailed and comprehensive review of the major ERP components. Comprising 22 chapters by the field's founders and leading researchers, this volume offers extensive coverage of the most widely used ERP components. Vision and memory are two of the most intensively studied topics in psychology and neuroscience. The present book concerns the interaction between vision and memory: How do we remember what we see? And how does our memory for the visual world influence subsequent perception and action? topics in psychology and neuroscience, and the intersection etween them--visual memory--is emerging as a fertile ground for research. This book provides a state-of-the-art account of visual memory systems. Each chapter is written by an internationally renowned researcher, who has made seminal contributions to the topic. The chapters are comprehensive, providing both a broad overview of each topic and a summary of the latest research. They also present new perspectives that advance our theoretical understanding of visual memory and suggest directions for future research. 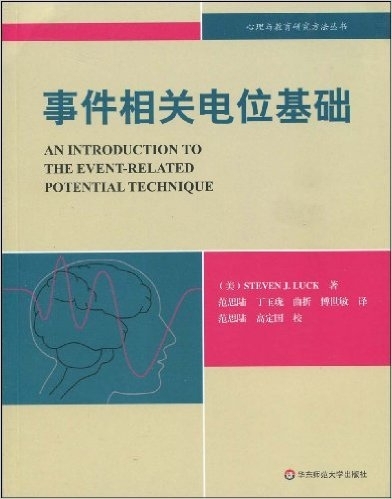 This is the Simplified Chinese Translation of the first edition of An Introduction to the Event-Related Potential Technique. Each edition of this classic reference has proved to be a benchmark in the developing field of cognitive neuroscience. The fourth edition of The Cognitive Neurosciences continues to chart new directions in the study of the biologic underpinnings of complex cognition—the relationship between the structural and physiological mechanisms of the nervous system and the psychological reality of the mind. The material in this edition is entirely new, with all chapters written specifically for it. The event-related potential (ERP) technique in cognitive neuroscience allows scientists to observe human brain activity that reflects specific cognitive processes. An Introduction to the Event-Related Potential Technique offers the first comprehensive guide to the practicalities of conducting ERP experiments in cognitive neuroscience and related fields, including affective neuroscience and experimental psychopathology. The book can serve as a guide for the classroom or the laboratory and as a reference for researchers who do not conduct ERP studies themselves but need to understand and evaluate ERP experiments in the literature. It summarizes the accumulated body of ERP theory and practice, providing detailed, practical advice about how to design, conduct, and interpret ERP experiments, and presents the theoretical background needed to understand why an experiment is carried out in a particular way.